Last night when I got in from work at approximately 18.45, I crawled gratefully into my pajama bottoms and got in the mindset for a relaxing evening of trashy tv, (I had BINTM and Styled to Rock recorded). It was then that I received a phone call; my boyfriend had left gig tickets at home and needed me to bring them into central London for him. Sigh, back to the train station I shuffled. As a thank you though, he met me at H&M on Oxford Street and had bought me this jumper I'd mentioned I had my eye on, n'aww:) I really like the slouchy fit, and well, metallics are always exciting! H&M have some such amazing autumn winter pieces in stock at the moment, and at such good prices! This jumper was just £14.99! Today I wore it with a tee underneath, also from H&M, which added a pleather collar to the equation...I also wore bright pink socks as, it is summer after all. I can't wait to wear it in the midst of winter with black skinny jeans and boots! Whilst on an errand to buy many macaroons today, I walked past Madelaine from Britain and Ireland's next top Model - who's been watching? Who do you want to win? I want Lisa to win! I'm your new follower! I just found you via lookbook.nu and I love your style. I'll be glad if you visited my blog. LOVE this outfit, and that was so sweet of your boyfriend :) I need those trousers in my life! I love Lisa! I really like America's Next Top Model as well, just because Tyra is so much more involved. adore this style so much! I am in love with this look! Peter pan collars = life. 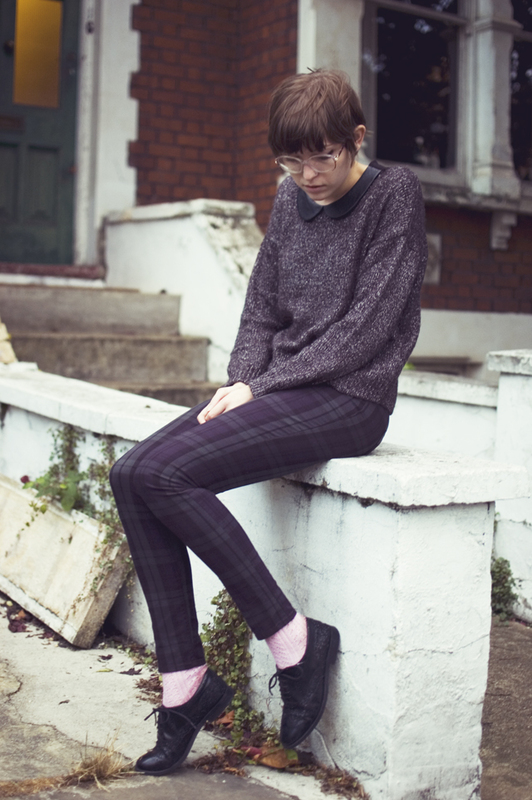 I only wish I had the courage to wear similar trousers in high school...they think I'm weird enough with my Dr Martens. what a great jumper which will be perfect for winter, and what a lovely boyfriend you have there too! I'm at work as I'm reading this, and i already imagined myself crawling into *my* pjs- 9 more hours to go! (how depressing). and you two are so sweet- you actually getting him the tickets, and him giving you a present. and what a lovely one at that! 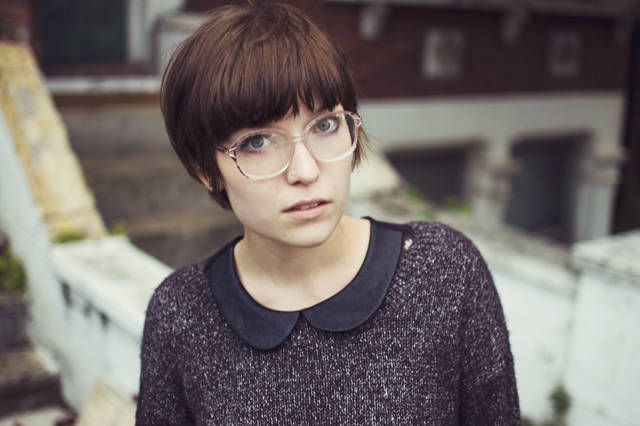 i especially love the peter pan collar- and i cant get over how cute your glasses are!